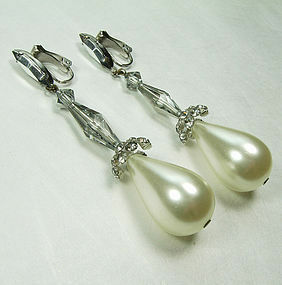 Glittering vintage 1960s clip earrings in silvertone metal with long marquise opaque glass silver prong set rhinestones, vitrail finished glass beads, and large acrylic faux pearls with brilliant rhinestones in silvertone metal. Marked LEWIS SEGAL. Nice size -- 2 7/8 inches long. Excellent condition. Display form is life size. Photos enlarged to show detail.